Our Sydney Showroom is now open for appointments on Thursday, Fridays and Saturdays at 6 William St, Paddington NSW 2021. We provide a one-on-one consultation and encourage you to bring an iPad with images of your / your client’s bedroom, paint and/or carpet chip to help us with fabric selection. We promise you will be so inspired by your visit! If you are looking at more than one bedhead/bed, potentially you may require a double consultation to ensure enough time is allocated to talk through all details so please consider this when booking your time on line. Be inspired by collaborations with our team of Sydney Brand Ambassadors and their styling of our products! These stylists know that great design begins with proper planning. All have visited our Sydney Showroom to see the bedheads, feel the fabrics and enjoy the Heatherly experience! By now you are no doubt familiar with Three Birds Renovations, especially with Lana on the cover of Real Living Renovations! These three best friends left their corporate jobs in 2014 and have just completed their seventh house renovation together, The River Shack, which we are thrilled to be a part of. These women bring a whole new fresh style to renovating. They’re savvy, energetic, enthusiastic and their designs are to die for. 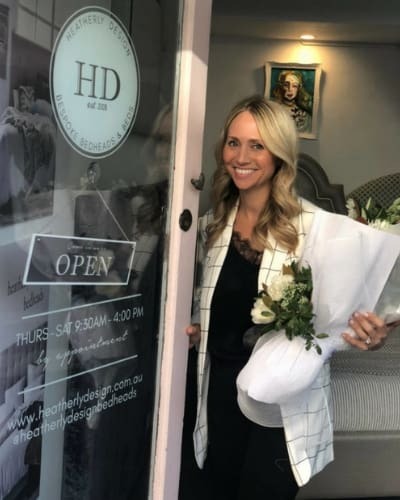 We had the pleasure of meeting Bonnie and Lana in our Sydney showroom where Bonnie selected designs and fabric for bedheads in the caravan and master bedroom, as well as some of our Ellison velvet cushions. You can enjoy The River Shack footage here and order these bedheads and cushions online now. It was such a thrill to design a bedhead for “the designer of all” Alex Perry, back in 2011. He chose The Albertine, a deep-buttoned design, in white leather. He then went on to judge our Heatherly “Best Bedroom” competition in 2013. It was an absolute pleasure working with Alex in sourcing the right coloured leather and creating one very special bedhead! “HEY GEORGIE, OUR GORGEOUS BED HEAD IS ABSOLUTELY PERFECT AND WE LOVE IT!!! (I THINK I SLEEP BETTER NOW THAT IT’S THERE!!!) THANK YOU SO MUCH FOR BEING SO FABULOUS TO WORK WITH AND FOR SUCH AN AMAZING PRODUCT!! !” Alex Perry.